In traditional Italian fashion, my family would make the Feast of the Seven Fishes every Christmas Eve. Over the years, the tradition has changed. We now tend to serve steak and pasta, with only a few of our seafood specialties. 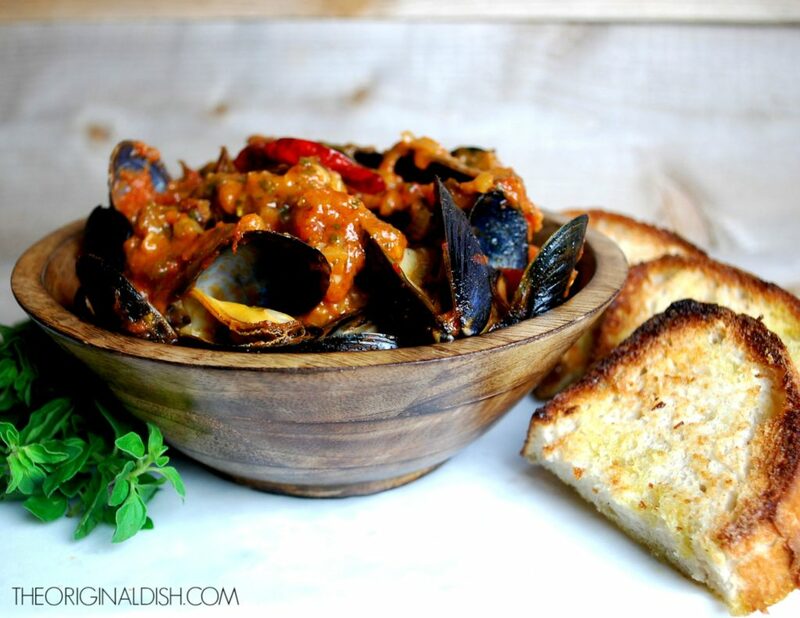 Mussels are always a big hit, so this year I am making sure they end up on our holiday table! 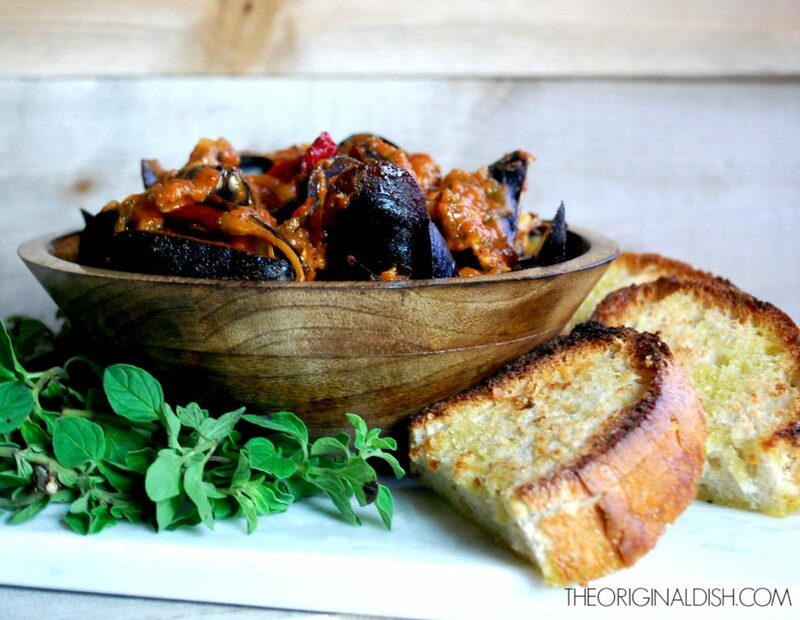 To keep things exciting this Christmas, I decided to make a new version of mussels that packs a ton of flavor into the dish. Mussels are so simple to prepare, so they’re perfect to make for a large crowd. They are sold and cooked alive, so it’s important to keep them chilled and open to the air before using them. After a quick cleaning and debearding, the mussels are ready to go. I made this recipe for 2 pounds of mussels, but it’s easy to double or triple if you’re cooking for a lot of people this holiday. Since the mussels are simple to prepare, I put all of my attention on the sauce: a spicy tomato-wine broth. This “broth” turned out slightly thicker than I intended, more of a sauce really, but it was too good to change. It starts off with shallots and garlic sautéed in olive oil to soften and release their flavor. I deglaze the pan with white wine for an acidic, sweet touch. Tomatoes, thyme, and lemon are added for fresh flavor and a robust taste. I spice things up with a couple of dried chiles de arbol. They reconstitute in the liquid and add a wonderful heat to the broth. After simmering all of these ingredients together, the mussels are added just for a few minutes, that’s all they need to steam. Once their shells open, they’re ready! After spooning the mussels out, I finish off the sauce with some butter and fresh herbs. Swirling in the butter gives the broth a rich, glossy finish. It’s hard to resist ripping off pieces of bread and just dipping them right into the sauce. But what makes it even better is crisping the bread up a bit first. With the broiler on high, I drizzle thick slices of Italian bread with olive oil and toast them just for a couple of minutes on each side before rubbing them with fresh garlic. You want them golden and crisp on the outside, but soft and chewy on the inside. 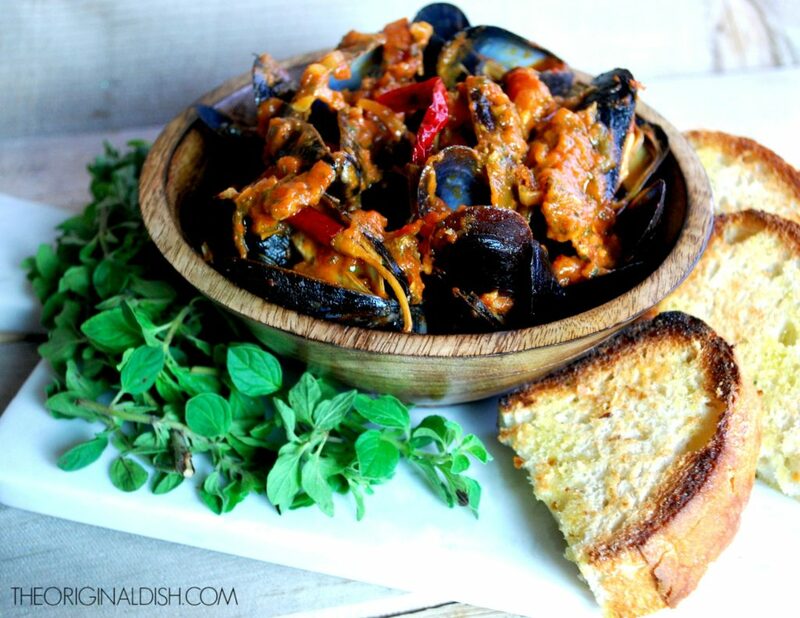 I serve the mussels with a heaping spoonful of broth and a few pieces of bread right alongside, ready to dip in! 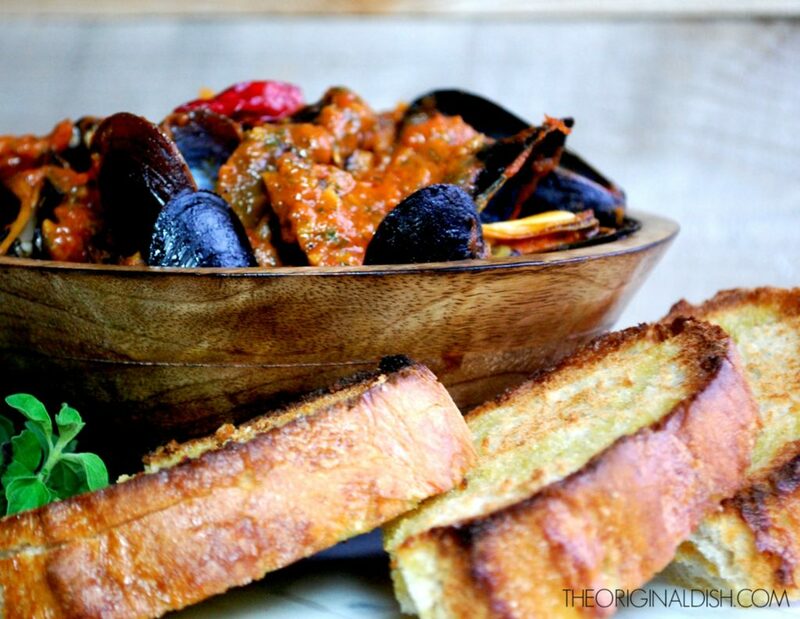 The broth works its way into all of the crevices of the mussels, and the bread soaks up the rest…a perfect combination. Enjoy! In a medium pot, heat the olive oil over medium heat. Add the shallots and sauté until soft. Stir in the garlic and cook for another minute. Deglaze the pan with the wine. Add the tomatoes, chiles, thyme, lemon juice, and lemon zest. Bring to a boil, reduce the heat and simmer for 20 minutes. Toss in the mussels. Cover the pot with a lid and steam them for about 3-5 minutes. Immediately remove the mussels as soon as they open. Cover the lid and repeat until all the mussels have cooked. If the mussels do not open, discard them. To finish, stir in the butter, parsley, and oregano to the broth. Season with salt and pepper to taste. Preheat the oven and turn the broiler on high. Slice the loaf of bread into 1-inch slices. Arrange the slices on a baking sheet and drizzle each side with olive oil. Toast in the broiler until crispy but still soft in the middle, just a minute or two on each side (watch them carefully…they will burn quickly). When they are hot, rub the garlic clove on each piece of bread. 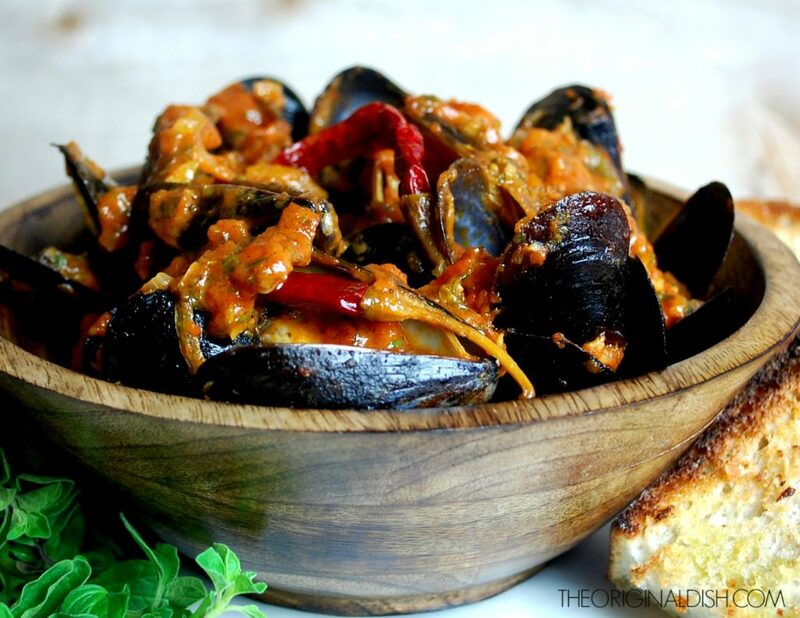 Serve the mussels in a large bowl with a generous amount of the spicy tomato-wine broth spooned over the top. Dip the crusty garlic bread into the broth. 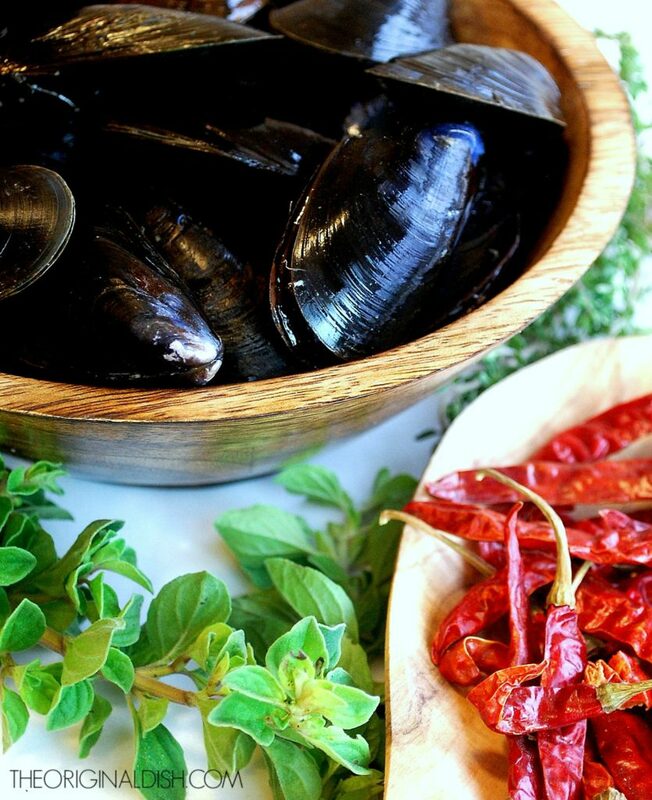 To clean, rinse and scrub the mussels under cold running water. Any mussels that are slightly open should be discarded (they should all be closed tightly shut or else they are dead). Lastly, check for thin, slightly sticky membranes on the side of each mussel, known as their “beard”. You must debeard them by pulling down on the membrane and pulling it off. As you always have in all of your creations.